Lyrics and information for The Honeycombs, Have I The Right. It has been claimed on "songfacts" and possibly in other places as well that Jimmy Pge played session guitar on this song. This is however untrue. I understand that Jimmy Page did do session work for Joe Meek but this band was a real performing group who had come from playing regular gigs. Every one was a genuine musician, and they had perfected a sound which Martin Murray had worked hard to achieve. But here is what Martin Murray himself said about this question just in case anybody needed further clarification. "I have heard this story many times before, the answer is NO. By the way, the same claim has been made by some other very famous session guys, I can't remember the names until I hear them again, as it was a long time ago. The only Musos to play on Have I The Right was the HONEYCOMBS." The hardest part of the recording was getting the stomping on the stairs. It was difficult to get sufficient monitors on the stairwell and the stamping kept getting out of sync with the rest of the recording. They did take after take risking eviction by Joe Meek's landlady but finally got it in the bag. When Pye released Have I The right on 19th June 1964 it took a little while to penetrate the market. In fact it got to number 1 on 27th August, 9 weeks later. At some point during this period Pye executives realised that the contract they had with the band was null and void and they arranged a meeting to renegotiate, hoping to get more or less the same deal as before. Martin Murray was however a savvy young man and took along his father's lawyer to the meeting. With their debut single now racing inevitably towards the number 1 spot, he had the strongest negotiating position imaginable, and was able to secure the best percentage of any band of the era. Considerably better, even, than the Beatles! Another claim about this song is that Denis D'Ell had difficulty hitting the high notes when performing it live. Joe Meek had an unusual recording technique, making the band play the song slowly and then speeding it p which put the key one or two tones higher. But Martin Murray assures me that not only could Denis sing quite high enough when he wanted to but that the band always performed the song live in the same key they recorded it in and not the key that it seems to be on the record. So this is simply nonsense. The Honeycombs recorded another version in German which matched the English language version in the German charts, both singles reaching number 21. You can see details of this version here. Tony Steven was quick off the mark with a 1964 cover that appears on an E.P. on the Crossbow label XB.023 there is little other information about this version. An album credited to The Howard Blaikley Orchestra on the Rim label ZS 03 features orchestral versions of twelve Howard and Blaikley tracks, including Have I The Right, side 1 track 6. A La Carte an all girl group of mainly English girls but based in Germany released an album called "Rockin' Oldies" Coconut - 205 473 in 1983. "Have I The Right" was track 2. The act also released a single version of "Do Wah Diddy". I must thank a reader "Daniel Toth" for pointing this out via email. Sova Nova is credited with a version in 1987 on Ariola 608 894-213 this was a 12 inch maxi single. Done in a disco style it might go down well at Butlins with the mums and dads and the kids all joining in. I will probably go to the bar and meet you later OK? More recently in 2010, Vampire Weekend covered the song. Their version is quite laid back and jazzy with tinkling piano and a kind of relaxed jam. Actually it is quite enjoyable, and it certainly seems as if they had a good time making the recording. This is probably available on iTunes as it appears on an iTunes session E.P. N.B. There is a song of the same title by Popcorn and the Mohawks, but is a completely different song. Lastly there is a song of this name by Hans Ter Berg on the Silenz label SICD 269508-3 but I can't find any further information so I don't even know if it is a different song or not. If anybody can help me with more info I would welcome that. There appear to be a number of album tracks with the same name from a variety of obscure artists. I suspect I could spend a very long time indeed dredging through each one for very little benefit. Danyel Gerard E.P. Vogue label EP961. 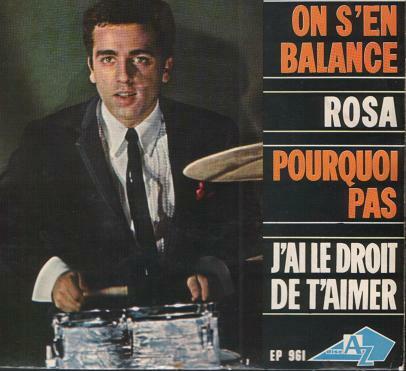 On S'En Balance / Rosa / Pourquoi Pas / J'Ai Le Droit De T'Aimer.